Looking for 38 special ammo that you can rely on to defend yourself or your family? It's time to get acquainted with Remington's Golden Saber loads! Remington Golden Saber 38 special ammunition is designed with self-defense in mind. Loaded with 125 grain, jacketed hollow point bullets this ammo is designed to inflict maximum damage to your target. That means an expanding bullet with years of research & development behind that doesn't plug when going through clothing and opens up a neutrailizing wound cavity in its target. 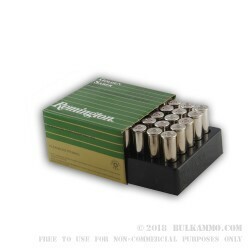 Remington is one of the best known and most respected ammo companies in the United States. They've served shooters for decades in the field, at the range and in emergencies. Pick up this box of 38 special ammo today and you'll have 25 rounds you can rely on when it counts. Q: Is this ammo +P as shown in the picture or regular 125gr? A: Hello Mac, This ammunition is loaded to +P pressures. Q: I really like this round. I have always been curious about the wadcutter bullet, but have never seen it on the shelves. Is that because it is not popular or is because it has been superceded by better bullets? A: This is a jacketed hollow point, not a wadcutter. Wadcutters are very popular for target shooting, but also are quite acceptable for defensive purposes. Jacketed hollow points are more oriented towards self defense. Q: Is this the type of ammo that is best for home defense? I am looking for a bullet that will do the job but will be a little more safe for my child in the next room in case of a stray. A: This Remington Golden Saber ammunition is a good choice for personal defense. Unfortunately, no ammunition has the potential to immediately incapacitate a violent attacker without having the potential to penetrate an interior wall with enough velocity and energy to harm individuals or structures on the other side. Q: My mother recently found some old 38 brass ammo that had belonged to my father many years ago (approx 20 years old). Is there a 'shelf life' for ammunition? They are still int their original boxes and have been safe from the elements. A: When stored properly, ammunition can last for many years and still be safe to shoot. If you are unsure about the safety of an exact lot of ammunition, you might wish to have it looked over by a gunsmith or range safety officer.